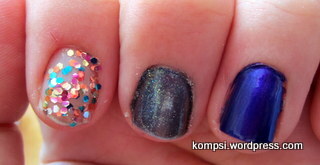 The Living Daylights is silver, gold, copper and teal hexagon shaped glitter in a clear base; On Her Majesty’s Secret Service is a sparkly, bluish gray with gold sparkle and Tomorrow Never Dies is an electric blue/purple. Here they are swatched in the same order. The Living Daylights is actually reflecting off my pink camera, so it’s not pink at all IRL. On Her Majesty’s Secret Service changes color with the light, so it can look more gray or more blue, with a gold shimmer. Tomorrow Never Dies is showing blue here, but it’s more purple in person. I was really excited to test out The Living Daylights, so I used it to tip my nails over OPI’s San Tan-tonio (a color that I love because of the name, but not necessarily to wear). I really like these two together, the neutral-ness of the base color really brings out the teal and copper flecks in the topcoat. 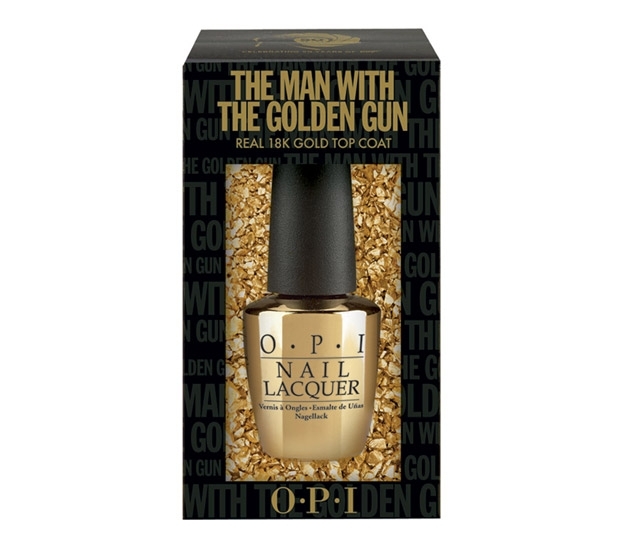 18kt real gold flakes for your nails?! Yes, please! I’ve been coveting this forever! So hopefully I’ll snag a bottle soon and post some pics! 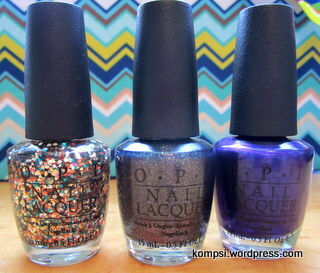 The Skyfall collection is available wherever OPI is carried. I purchased my bottles at Ulta. I had asked about The Man With The Golden Gun and was told they only received two bottles in their initial shipment! Craziness! Anyway, the regular polishes retail around $8.50 and the gold flake is around $30. I know! But it’s real gold! Also, I figured I’ll only be using it as a top coat or as an accent nail. 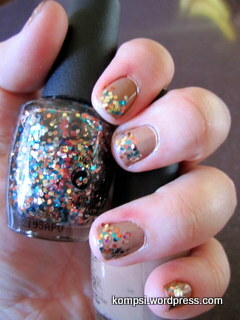 OPI for Sephora has a real gold topcoat, but it’s tiny like glitter, not the big flakes like this one. But it’s definitely an indulgent purchase haha. I’d probably buy it too if I had access! I’m just jealous haha! !